Your medium-length hair may leave you feeling like it isn’t long enough for a style, but that’s a common misconception. 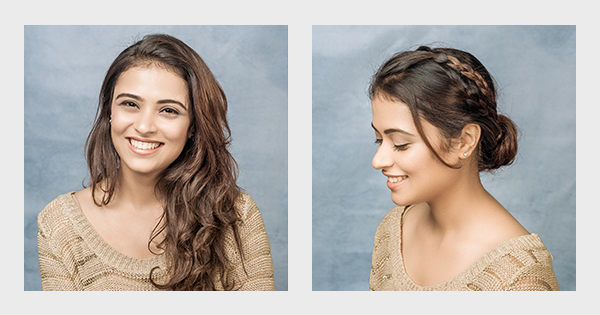 Our Braided Updo look is a cute and easy hairstyle for medium hair that fixes the problem! Step 1. Make a parting and take 2 sections of hair from either side of parting. Step 2. Take the section on left side, and make a loose braid starting a little lower. Step 3. Take the section on the right, bring it on the left and make a loose braid. Step 4. Next pull back all hair including the braids and secure into a ponytail with a hair elastic. Step 5. Twist the ponytail, around the elastic to form a bun. Step 6. Secure in place with bobby pins. An evening dress or your daily casuals, everything seems complimented with this easy hairstyle for medium hair.